14 Inch Size I - SHIPS FREE! 14 Inch Size II - SHIPS FREE! 14 Inch Size III - SHIPS FREE! 14 Inch Size IV - SHIPS FREE! 14 inch Size V - SHIPS FREE! 14 Inch Size VI - SHIPS FREE! 10 Inch Size I - SHIPS FREE! 10 Inch Size II - SHIPS FREE! 10 Inch Size III - SHIPS FREE! 10 Inch Size IV - SHIPS FREE! 10 Inch Size V - SHIPS FREE! 10 Inch Size VI - SHIPS FREE! 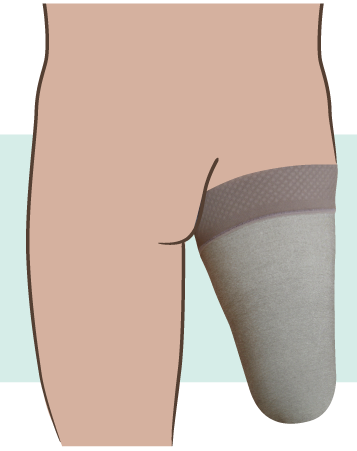 Stump Shrinker Socks, manufactured by Juzo, are stump shrinkers for those with above the knee amputations. These Stump Shrikers are ideal for maintaining the shape of the stump while reducing phantom pain associated with amputation. 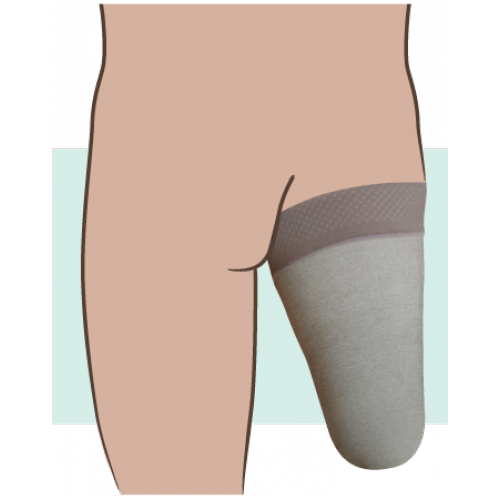 These Amputee Stump Shrinkers are made from a soft, Varin material that features lay-flat seems to reduce skin irritation caused by compression. Juzo Silver Stump Shrinkers are made with X-static silver threads that are anti-static, so that this Stump Shrinker will have static cling problems. Silver compression sleeves also feature antimicrobial, odor reducing fibers. Juzo Silver Stump Shrinkers are hypoallergenic and latex free, so they are suitable for most individuals who have above the knee amputations. The Roman numerals (I, II, III, etc) are based on the circumference of the thigh. Size I is suitable for 17 3/4 - 21 1/2 inches; II - 19 1/2 - 24 inches; III - 21 1/4 - 26 3/4 inches; IV - 22 1/2 - 28 3/4; V - 24 1/ 2 - 30 3/4 inches.